I am always on the lookout for books with great twists. I actually prefer to know if a book has a twist before I begin reading it. Then I can have fun trying to guess what it is throughout. 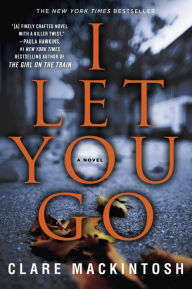 Clare Mackintosh's I Let You Go appears on many "Books With a Twist" lists, and I can honestly say that I NEVER saw this one coming. There's not much I can say here without giving anything away. This is what I'll tell you: The lead character, Jenna Gray, is living a nightmare and escapes to a remote village where everyone knows everybody else. She finds love there, but eventually, as it always does, her past comes back to haunt her in a big way. That is the absolute most I can tell you without spoiling anything. The twist and ending are magnificent, but I Let You Go is also a powerful tale of grief, guilt, and unimaginable horror.